Continental National Bank, Miami’s premier community provider of financial services for small businesses and entrepreneurs, proudly announces the launch of a third session of its GROW Entrepreneurship Program, a business education initiative introduced as part of a community effort to help local professionals sustainably grow their businesses. Following the recruitment success of two prior terms, a third session has been scheduled and is now open for enrollment. Interested entrepreneurs are encouraged to apply by May 10th. 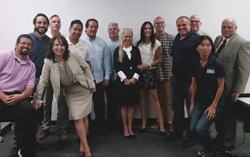 Developed in conjunction with Florida Small Business Development Center (SBDC) at Florida International University (FIU), the GROW Entrepreneurship Program seeks to inspire and engage the next generation of Miami business leaders. To date, the program has granted access to key educational and networking resources to over two dozen local businesses. GROW’s third session will be held from May 24th through June 29th. Qualifying applicants will have the opportunity to train alongside experienced SBDC mentors on various topics related to marketing and brand strategizing. The program’s curriculum will primarily focus on instilling participants with an advanced understanding of trend analysis, goal benchmarking, and technology concepts crucial to gaining a competitive advantage in today’s marketplace. They will also be able to engage in seminar discussions with peers representing other local companies. GROW Entrepreneurship Program training sessions are held on Tuesday and Wednesday nights from 6 p.m. to 9 p.m. at the Continental National Bank’s Little Havana branch. To review eligibility criteria, and to learn more about how interested small business owners can apply, please visit https://www.continentalbank.com/grow. Continental National Bank is a full-service community bank established in 1974 in Miami as the first Cuban-American-chartered national bank in the United States, serving its customers for 43 years. With six branches conveniently located throughout Miami-Dade County, and with more than $440 million in assets, Continental National Bank was awarded the five-star “superior” rating by Bauer Financial and also has been rated “Outstanding” in their Community Reinvestment Act evaluation by their regulatory agency. The Bank offers a full range of financial products and services for retail, business and institutional clients. To learn more, please visit http://www.continentalbank.com, and follow us via http://www.facebook.com/continentalnationalbank, and http://www.twitter.com/cnbmia.